Throughout the region one sees a small number of cows, usually 1-3, attended by a single person. One never sees cows alone --- either in the field or along the road. Often one could see a dozen cows in a field, but there were always several people sitting or standing patiently with the cows. 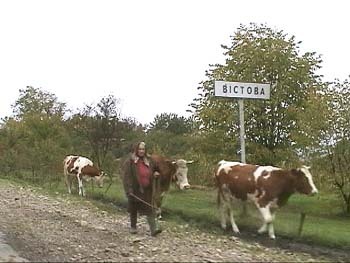 Often you see a few cows walking along the road with an old woman tending them as above.